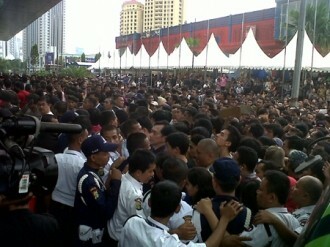 A scheduled smartphone launch event in Indonesia has turned ugly and resulted in coordinators canceling the event early. Thousands of people showed up to get their hands on the latest BlackBerry mobile phone but when rumors began to spread that the device was sold out, chaos took over. Research in Motion chose Indonesia as the first country to receive the BlackBerry Bellagio, otherwise known as the BlackBerry Bold 9790. BlackBerry handsets are still wildly popular in Indonesia and as such, organizers set up a special event at the Pacific Place mall in Jakarta to celebrate the event. RIM offered a 50 percent discount to the first 1000 people to purchase the phone which prompted a line to form a day before the event. Those eligible for the discount were initially given a red wristband but as the crowd swelled, organizers announced that everyone on hand would get a phone. It wasn’t long before rumors spread that the phone had sold out and people lost their patience. One thing led to another and potential buyers stormed security barriers to try and get their hands on the new phone. The Jakarta Globe is reporting that as many as 90 people had to be treated for injuries ranging from broken or fractured bones to unconsciousness. Around 200 police officers and security guards were dispatched to control the chaos and as a result, the event was canceled prematurely to ensure everyone’s safety.